Theoretical knowledge is one thing. Knowing how to turn knowledge into corporate success is the key difference between average and excellent decision makers. All Workshops are designed to be modular and will be tailored to your individual goals and the specific requirements of your institution. Frank T. Piller is a sought-after researcher, speaker, and corporate adviser in innovation management and value creation. He a Co-Director of the MIT Smart Customization Group at the MIT Media Lab, Massachusetts Institute of Technology, and a chaired professor of management at the Technology & Innovation Management Group of RWTH Aachen University, Germany, one of Europe’s leading institutes of technology. Frequently quoted in The New York Times, The Economist, and Business Week, amongst others, Prof. Piller is regarded as one of the world’s leading experts on developing innovative business models for mass customization and personalization. His group at RWTH Aachen is considered to be one of the globally leading research centers for open innovation and customer co-creation, acknowledged recently, for example, by a finalist nomination for the „Innovating Innovation“ Award 2013 by Harvard Business Review and McKinsey for their work on implementing open innovation or the 2012 Global Co-Creation Award by PDMA (the largest professional association for product and service development) for their work on ideation contests with senior citizens. 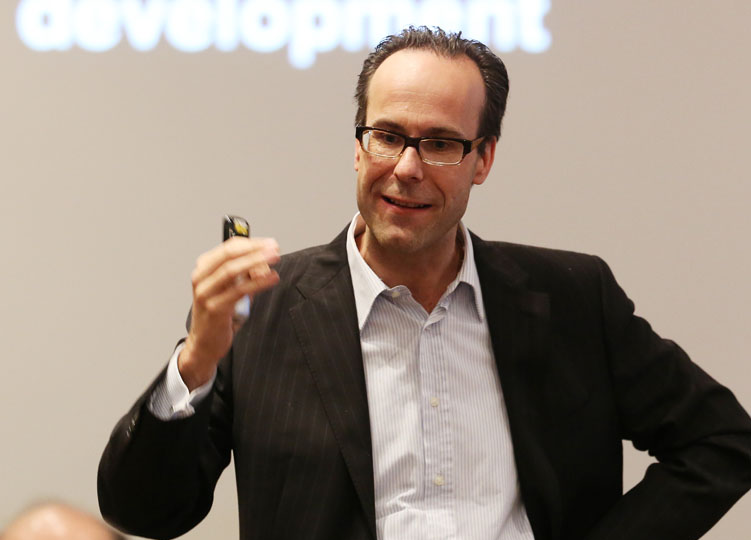 Based on his strong background of rigor and relevant research, Frank Piller is an acclaimed keynote speaker at management conferences and in executive innovation management workshops around the world. His presentations and keynotes are frequently evaluated as „best of show“. He has delivered customized executive classes for many Global1000 companies and innovative startups alike. Examples of Corporate Executive Innovation Management Workshops. At Some of the Worlds Most Innovative Companies. Digitalization is one of the hottest management topics right now – and will stay extremely relevant for the years to come. Companies, both SME and global players, need a solid (business model) innovation strategy for and sufficient understanding of what Industrie 4.0 really is – and what it is not. We expect the Internet of Things and Services to be a major driving force for disruptive developments within nearly all branches. The success of companies to adapt and profit from digitalization will heavily depend on acting early enough – before emerging Start-Ups and innovative competitiors take the market. 1 to 2-Day Executive Innovation Management Workshop for the Innovation Leadership Team. 1 to 2-Day Executive Program (sometimes including organization of field trips and life case studies). Internal Seminar for 3M Europe, Neuss. Keynote at the ExxonMobil Innovation & Technology Fair, followed by a workshop for key decision makers; Fairfax, VA. Two-day Executive Training for NEC Co-Creation Leadership Team; N.E.C. Japan, Nara. 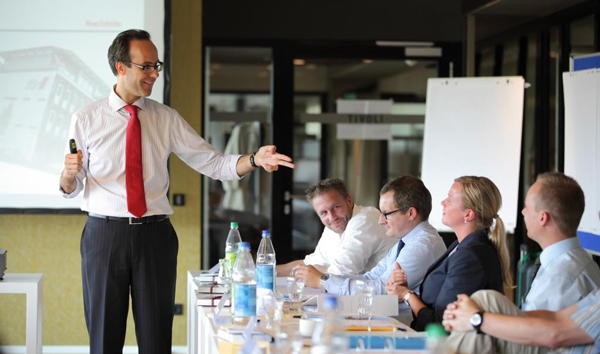 2-Day Executive Program (also available as a 5-Day official RWTH Certificate Executive Program). Panel Keynote for the SIEMENS Innovation Day (on invitation by the CEO of Siemens), Munich. Keynote at HAYS International Client Conference. Munich. Closing Keynote at the Steelcase Annual Conference, Cologne (IMM Trade Show Side Event), Cologne. Presentation at the Annual Executive Board Meeting of the Oetker Group, Wiesbaden. Douglas Group Innovation Day. Presentation & workshop delivered at the strategy board meeting of Douglas Holding (Retailer including Douglas, Thalia, Hussel). Opening keynote of the Siemens AG Innovators Meeting, München. Exemplary Elements of a Three-Day Innovation Leadership Class. Fully Customizable to Individial Corporate Needs. Day One: Principles and Critical Successfactors of Innovation Management. Day Three: Innovation Culture and Implementation.